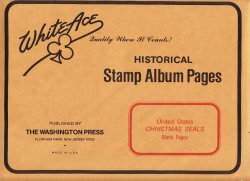 1930-65 U.S. National Christmas Seal Block Collection. Issued by the National Tuberculosis Association (NTA). There are thirty-six (36) blocks of four (4). This set is fresh, full gum, P4S, F/VF, MNH. Excellent start, or addition to your collection. 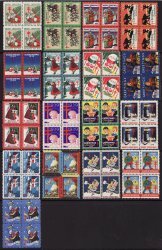 1930-65 U.S. National Christmas Seals Block Collection. There are thirty-six (36) blocks of four (4) seals. This set is fresh, full gum, P4S, F/VF, MNH. Issued by the National Tuberculosis Association (NTA). Excellent start, or addition to your collection. Instead of collecting full sheets, blocks of four (4) are an excellent alternative. Scan is an example of the seals in the collection. Note: Also available as SE, F/VF, MNH for $11.75 at checkout.